Earlier this week, U.S. Commerce Secretary Penny Pritzker announced the launch of the U.S. Cluster Mapping and Registry project, a national economic initiative based at Harvard Business School’s Institute for Strategy and Competitiveness and supported by the U.S. Economic Development Administration. The U.S. 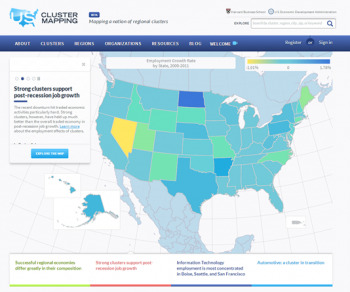 Cluster Mapping and Registry project aims to strengthen U.S. competitiveness by understanding the economic performance of clusters and regions across the United States. EDA staff gets inquiries daily from different organizations looking for grant information. Every community we speak with has a plan it is developing to spur economic growth and create jobs. Some are more fleshed out that others, but EDA’s advice is always the same: look at the resources in your community and make sure this project fits with the economic strengths of your area. In short, identify your regional clusters. Traveling this week on my first official trip as Assistant Secretary for Economic Development, I was honored to participate in the National Congress of the American Indians mid-year conference “Claiming our Rights and Strengthening our Governance” in Anchorage, Alaska. While there, I served on a panel with Kevin Washburn, Assistant Secretary of Indian Affairs at the U.S. Department of the Interior, Kevin Gover, Director of the National Museum of the American Indian and former Assistant Secretary of Indian Affairs, and James M. Olguin, Councilman, Southern Indian Tribe. We met with tribal leaders for a focused discussion on the importance of developing modern trust management systems and creating the conditions for economic growth on tribal trust lands. I am incredibly excited to join EDA at this critical time for our nation’s economic growth. As our country continues its recovery, EDA plays an important role in partnering with local communities to help them become robust regional engines for business creation and job growth. I was born and raised in Youngstown, Ohio. My city had a thriving manufacturing economy for years – until it didn’t. The hard times that befell my community and the federal support that helped it bounce back give me a special and very personal appreciation for the importance of EDA’s mission and work. I am humbled to have been chosen by President Obama for this position, and I look forward to working with partners in the federal government and in communities like yours to continue to grow our economy and make our regions more competitive. Roland Stephen is the Associate Director for Higher Education & Economic Development in the Center for Science, Technology & Economic Development at SRI International. He is presently a co-leader on four studies for the Economic Development Administration, Department of Commerce. He has worked on performance assessment in higher education and on regional economic development strategies. Prior to joining SRI, Dr. Stephen had seven years of leadership experience at the Institute for Emerging Issues (IEI), an applied policy unit at North Carolina State University, where he was also an associate professor in the School of Public and International Affairs. He has directed policy research, strategic planning, program design and public engagement in the areas of technology policy, higher education policy, and regional economic development. Dr. Stephen received his Ph.D. in International and Comparative Political Economy from UCLA and his B.A. in Economics and History from Cambridge University, United Kingdom. There are a few things that are consistently drilled into us throughout our education. We’re told from a young age to always check our work or proofread our papers. We are also instructed that we should say “may I” instead of “can I.” Most fundamentally, across any and all subjects, we are taught the importance of data. While it isn’t always referred to as such, data is the supporting argument in an essay, it’s the showing our work in math, and it’s the basis of defending any theory. In 2008, the Port of Gloucester, Massachusetts, was at a crossroads. The harbor, formerly the heart of the city, was contributing less than 1.5% to the tax revenue for the city and the fishing industry had shrunk by 80 percent over the previous 25 years. EDA funds a number of projects and tools to help communities and regions evaluate their economic opportunities and help them build capacity. The tools are intended to assist with economic development, but sometimes it’s challenging to really measure the impact of a project. Thanks to an in-depth analysis of EDA’s University Centers (UC), we now have some valuable information assessing the best practices of this particular endeavor.